LINFORD LANE: Big, Stronger and Almost 1!! Big, Stronger and Almost 1!! Ryder turns one next week. 3 weeks ago he did this crawl like a lizard. He was fast and efficient at it. 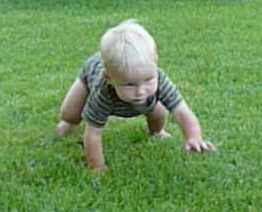 His knees would not touch the ground, allowing him to move faster and not touch the lawn with his legs. Last week we walked efficiently. 11 1/2 months walking. People kept saying, oh no he is about to walk. The real problem is he is learning to use his legs. I often walk in the room and he is now on the hearth, on Bode's stool in the bathroom with the sink on soaking wet, almost in the toilet, on the kitchen table, on the bench in the front yard with no idea how to get down, up the slide in the backyard and now stuck at the top, scared to come back down the slide. He loves to twist his little head the side and point at something for you to look at. He loves playing cars, you push the car to him, he brings it back to you. He loves being kissed lots of times in a row on the face or neck. If you do it once, he will lean in for more and more. He is very independent and almost always wearing a smile. He follows his brother around and tries to keep up, always sacrificing whatever toy he brought to his brother. He loves the turtle... when the turtle sees him coming you should see it move. Happy Birthday Ryder. What a blessing you have been to us! We love you forever! WOW, time goes by fast. Happy Birthday Ryder!